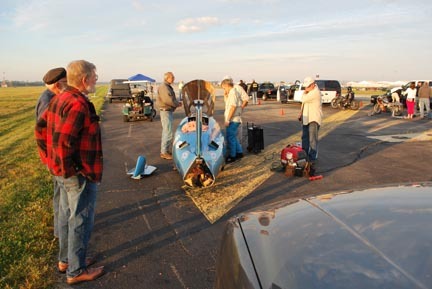 This photo was taken in October 2012 out at Bonneville. 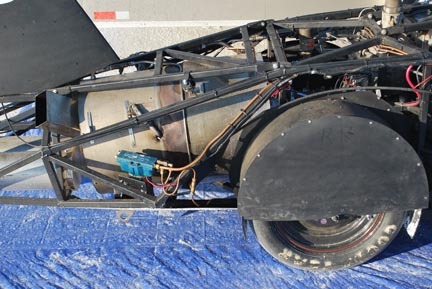 The vehicle was welded up by Chuk Williams and it has a long and checkered career which is why it is body less in the photo. We do not have the time. The engine is the old PSL engine that Art Gardiner designed 25 years ago and that Jim Tangeman did the machining for the hot end. PSL stands for Planing Steam Launch as they were going for the steam boat world’s record set in 1900 sometime by a steam boat, “The Arrow”, made by Charles D. Mosher that had 4,000 horse power and weighed 66 tons and went close to 50 miles an hour. 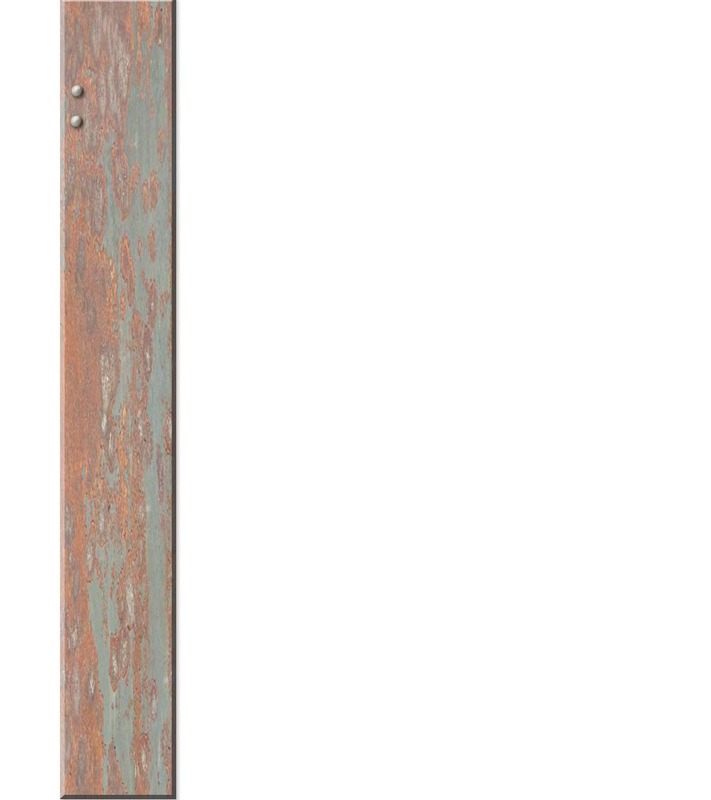 It was 180 feet long. 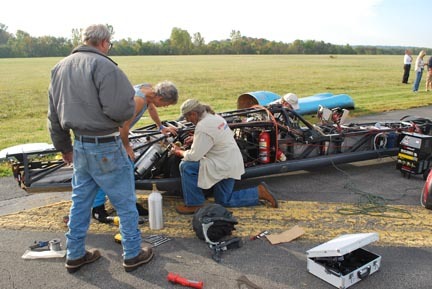 Due to complex circumstances a boiler for this boat project was not made and so the engine languished. 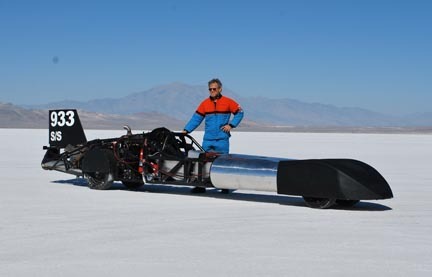 About 10 years ago Chuk obtained the engine from Art and a boiler from Jay Carter and made his famous dragster that would do about 65 mph in an eighth mile standing start acceleration run. Since then he made a boiler (steam generator) that will produce 1200 pounds of steam an hour and thus keep up with the PSL engine. 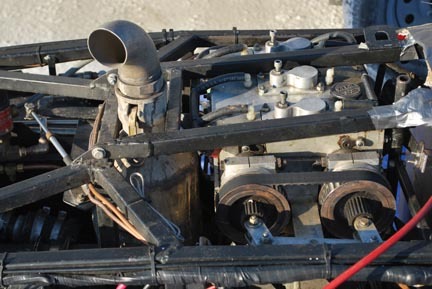 The PSL engine has 3.125” bore and 2.80” stroke and displaces 64 c.i.d. as a three cylinder engine that started out being an outboard motor and with the addition of some International Cub cylinder liners and pistons is now a steam engine. 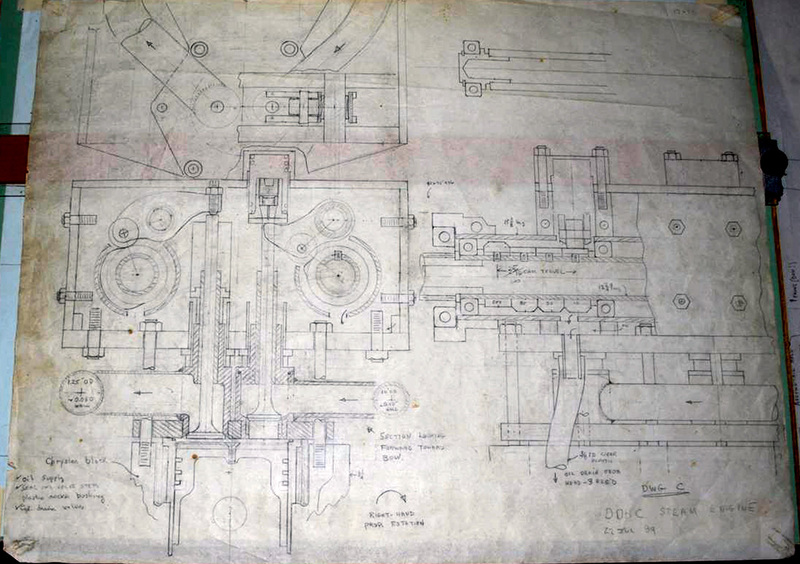 Also with the addition of poppet valves as per the blueprint shown. This engine was originally built to go into a planning speed launch, hence the PSL designation. It was designed around a re-build kit for an International Farmall Cub C-123 engine which fortuitously had four cylinders so there was an extra part for the three cylinder Chrysler outboard engine block that was the basis of the PSL engine. The Farmall tractor was originally a 3” bore and 4” stroke. For the steam engine the liner was bored out to 3 1/8” and it used the outboard’s original 2.8” stroke. The outboard had an original bore of 3 5/16” and so the liner was machined down to fit tightly into that bore. The re-build kit included pistons as well as cylinder liners and so the tractor pistons were used. Because the wrist pin was lower in the piston than its location in the outboard piston the liner stuck a little bit above the block. Things were machined so that the little end of the original outboard connecting rod fit the wrist pin in the tractor piston. Or maybe it was the tractor piston that was re-machined a little. Jim Tangeman did the machining on the hot end of the PSL engine. He has also designed a steam launch engine around a cut-down Ford in-line six and this same C-123 re-build kit, hence his familiarity with the concept. At Bonneville the burner burned, the water pumps pumped, the steam generator generated, and the engine turned around. Every so often we would tighten things up and bolt things back on and we got some good runs in. I wound some of the coils out of ½” schedule 40 black iron pipe, pancake coils, for the boiler and am excessively proud of the results. 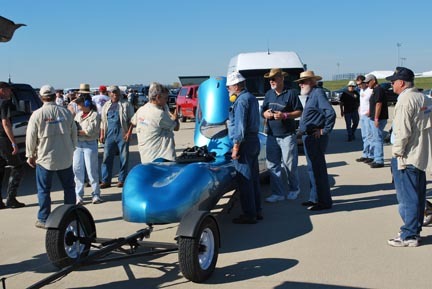 Chuk Williams LSR steam car in line at the Ohio Mile, Wilmington, Ohio October 2013. Tony Grzyb at the right in hat and beard. 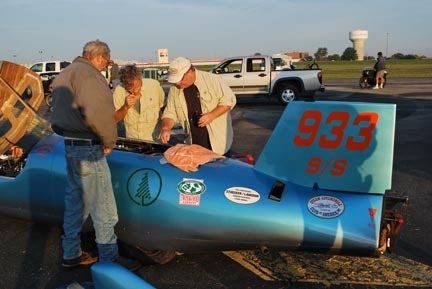 Last minute trouble shooting: Tom Stoecker, Chuk Williams, Scott Haines near the starting line. More trouble shooting looking for the electrical short. Dan Greger kneeling. Almost put together at the starting line, George Knight in plaid on the left. 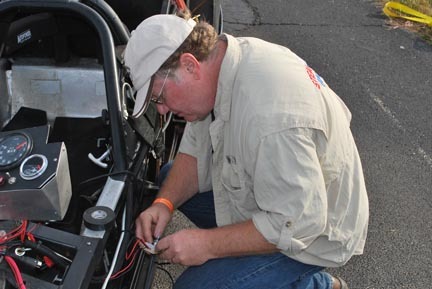 Scott Haines fixing the potentiometer that shorted out so the burner fan did not run.